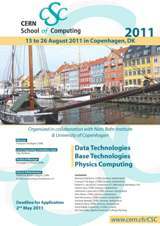 Welcome to CSC2011, the 34th edition of the CERN School of Computing. 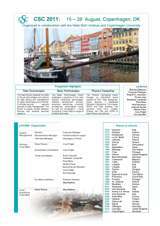 I would like to warmly thank all those who made this edition of the CSC possible: all our lecturers, track coordinators, members of the advisory committee, the CERN administrative and technical staff, as well as our national co-organizer, the Niels Bohr Institute, and specially Prof. Stig Skelboe, the chair person of the Local Organizing Committee and the team working with him. 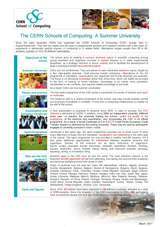 Since the early seventies CERN has organized the CERN Schools of Computing (CSC), usually held in August/September. They last two weeks and are open to postgraduate students and research workers with a few years of experience in elementary particle physics, in computing or in related fields. Attendance ranges usually from 60 to 80 students, typically of 15 to 30 different nationalities.